The story starts off like this; A Dinosaur, an Astronaut and an Audio Engineer walk into a bar. In the latest release from IK Multimedia they not only give us the punch line but continue to change the way we approach making our recording projects sound the best they can. Let’s start at the beginning or even before that. The prehistoric audio world consisted of behemoths that roamed the earth living in recording studios famous for bringing us the classic music we are still enjoying today. I was fortunate enough to be able to work in some of these classic styled studios and the sounds and experience were a big part in shaping my life as an arranger, musician and producer. So many times we forget the amazing things that we enjoy today were forged in a very different era that preceded us. IK Multimedia was the first company to introduce us to an integrated software mastering solution to using these vintage ancestors in our recordings. The latest version of T-RackS goes over the top to bring you not only the classic processors included in the previous versions of T-RackS but brings you some new additions as well. Building on their history of emulating classic audio gear. IK Multimedia continues to refine and improve on their circuit modeling technology that allows these beautiful sounding tools to live inside of our computers. 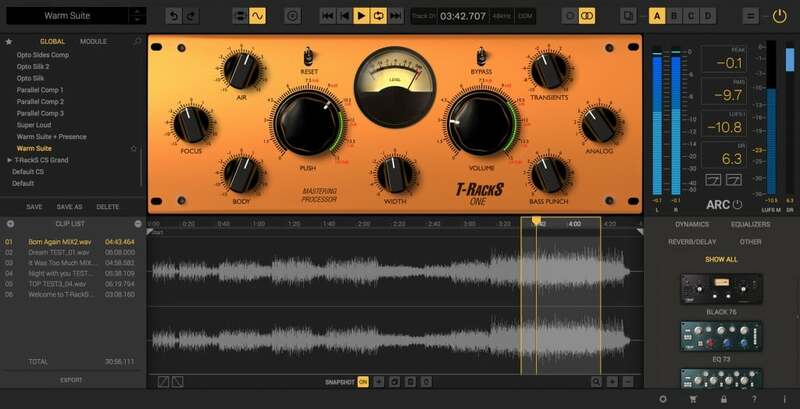 EQ, Compression, Dynamics, you name it, T-Racks5 gives you the tools you need with room to grow. You can start with the free CS version which includes their Classic EQ and basic metering options or go all the way to T-RackS 5 MAX which includes the entire suite of 38 processors, effects and advanced metering. 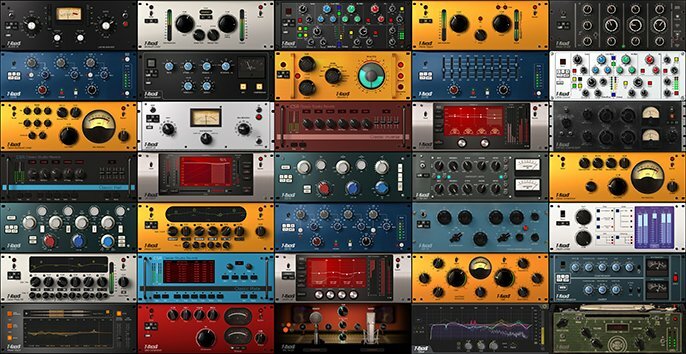 All of the T-RackS modules and plugins have been updated with a fresh coat of paint and optimized with a cleaner look for the best visual experience whether stand alone or inside your DAW. You can see in the above image that T-RackS 5 introduces us to a brand new standalone workflow. This allows you to perform most mastering and processing operations without even going to a DAW or additional audio editor. The layout gives you so much flexibility in resizing and organizing the interface to customize and adapt to your own personal workflow needs. All of the bells and whistles would mean nothing if the sound wasn’t good. T-RackS 5 now is exclusively 64bit which follows a trend to move into the future. 64bit processing ensures the best possible handling of your audio end to end and paves the way for continued improvements and updates when they are available, keeping you ahead of the curve. T-RackS 5 can handle audio bit depths up to 192k 32bit. Let’s take a look at some of the new exciting modules T-RackS 5 have added to their already fantastic collection. We hold these truths, that not all frequencies are created equal that is why we need equalizers to help us bring balance and equality to our tracks and mixes. One of the NEW modules in T-RackS 5, EQual proves you can have your cake and eat it too. Providing 10 bands of “hybrid” parametric EQ that combines the accuracy and precision of digital with the character of the analog world. they do this by once again using their vast history of circuit modeling bringing the DNA of historic American and British EQs to life. The built in spectrum analyzer is a great assistant in zeroing in on that particularly hard to find frequency. This processor is a pristine emulation of a classic “tube” compressor many audio engineers refer to as “The Glue”. Being able to process dynamics on a master to bring things together is a challenge and this processor handles it in typical T-RackS fashion. This new processor combines some of the most frequently used mastering tools in a single module. Having all of the controls accessible in ONE module really helps keep things moving as everything is simplified. I found when using this module it was very quick in giving me some very immediate results as I worked on a master mix. In recent years we have seen a trend for mastering engineers to push the levels of masters to the edge of sanity. The so called loudness wars saw an unprecedented increase in pumping up the volume, using brick wall limiters to create a master when looked at in an audio editor looked like a three to four minute rectangle. Thankfully we are seeing a new trend, one that focuses on dynamics rather than loudness alone. T-RackS 5 brings you a collection of metering tools that can be used in the stand alone version or within your DAW. This allows you to look deep inside your tracks and master to make sure you are getting the best dynamics and loudness possible. You may not realize it but when you upload tracks to the major streaming and delivery services (iTunes, YouTube, SoundCloud, Spotify, etc.) they use their specific algorithms to normalize your audio for their specific service. If your master is outside their boundaries then when it is processed by them the resulting audio could suffer from the additional processing. Having your audio already compliant in the dynamic range your particular provider is looking for ensure that your resulting audio will sound just as good as when you first delivered it. The advanced metering in T-RackS 5 give you an inside view of all of the current loudness standards. The science and engineering that go into each IK Multimedia product is astounding. They are one of the premier leaders in creating virtual circuit modeling that allows the creation of these beautiful analog processors that live in the digital world without sacrificing their original spirit and sound. No longer do you have to have warehouses to store all of the hardware, IK Multimedia makes them accessible through your computer screen, amazing. In every version of T-RackS IK Multimedia refine and innovate. This is even more true in version 5 where they continue to push the envelope of what you can do with your audio in a flexible modular enviroment. The new unified interface T-RackS 5 introduces allows you to combine and arrange your effects, metering, mastering and assembly of your project in a fresh way. One of the amazing new modules introduced with T-RackS 5 is their Master Match processor. Master Match is an amazing resource to get a good start on mastering your audio. What it does is analyze a up to 3 reference audio sources of your choosing and then analyzes them to work on the audio file you are currently working on. It is almost like having your own personal veteran audio mastering engineer sitting next to you. 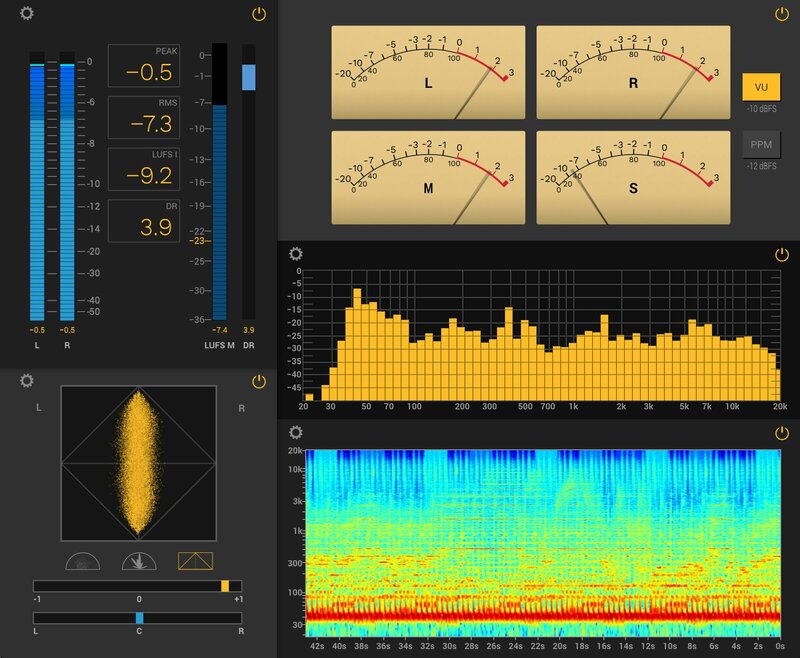 Master Match analyzes your reference audio file(s) for dynamics, EQ, levels and overall tonal balance. Once the learning is complete it will apply its findings in an attempt to “match” your master to the reference. Not stopping there you have some fine tuning control over the extent of how much influence the learned reference has over your master in the areas of levels and spectral balancing. It is one more amazing advancement that shows IK Multimedia’s continued boundary pushing vision to give us unique and powerful tools to create powerful, quality audio masters. There is so much about T-Racks 5 that we could not cover in this review but the great thing is that you can discover each module individually through the FREE T-RackS 5 CS (or higher versions). There you can audition each module during a 14 day FREE trial before purchasing to see if it fits your workflow and specific need. So when the Dinosaur, Audio Engineer and the Astronaut come out of the bar they have a beautiful dynamic and balanced master recording of their latest project that speaks highly of the quality and care IK Multimedia continues to bring in their audio software products. Start your journey into the future by downloading T-RackS 5 CS Free today and pretty soon you will be adding to your collection as you see and hear what a little dinosaur can do for your audio. For more information visit IK Multimedia’s website.